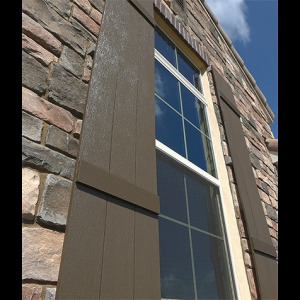 Fypon’s shutter line offers two new polyurethane woodgrain styles including Board & Batten and Plank. Sizes range in widths of 12", 14", 18", and 24", and heights of 24" to 120", available in 1" increments. Fypon’s shutter line offers two new polyurethane woodgrain styles including Board & Batten and Plank. Sizes range in widths of 12", 14", 18", and 24", and heights of 24" to 120", available in 1" increments. Fypon also offers an added accessory line of hinges and clavos that create a distinct look for your shutters.